Our NSF-IGERT studies at Summit, Greenland are designed to investigate aspects of snow, firn, and ice core interpretation, as part of our larger look at polar environmental change in Greenland. 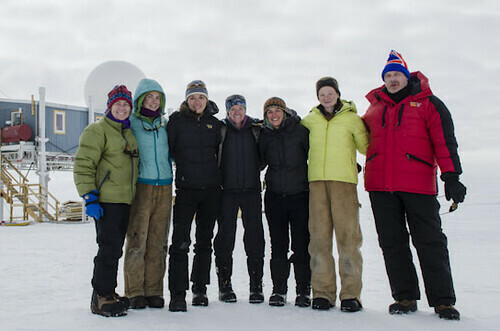 Coming to the site of the GISP2 ice core, where ice core scientists first realized that climate could change in less than ten years, is a real adventure for our graduate students! Being here now to witness a new change and to measure its effects — the first significant melt at this cold high-altitude site since 1889 – is but one of the great opportunities to showcase the excitement of working in polar science! The National Science Foundation has facilitated this unusual and extremely educational opportunity in this brief round of science here at Summit, the very top of the Greenland Ice Sheet. Our third-year IGERT student, Kaitlin Keegan, came up earlier to conduct snow science with the JSEP group of high school students; she then left Summit before our arrival to venture on to the NEEM site. I have thoroughly enjoyed the honor of leading the discoveries with our first-year IGERT students – what a bright group of PhD students they are! We made stratigraphy, density, and permeability measurements on important layers in the snow. 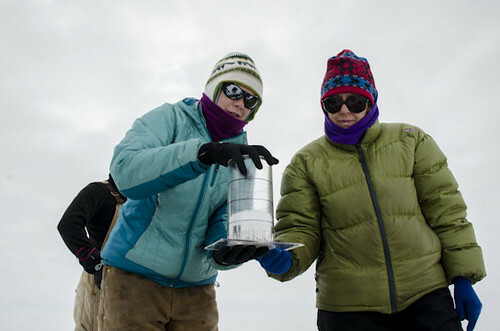 Stephanie Gregory and Mary Albert discuss a snow sample for a permeability measurement. We collected samples of the refrozen melt layer to take home for more detailed measurements. 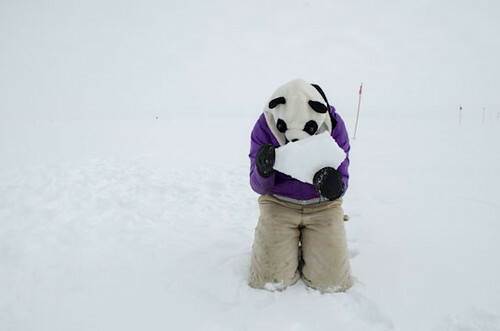 Hey, even our panda got a taste of ice science! Being at Summit immediately after the first big melt there since 1889 has been a great science & education opportunity! We are all very thankful to the NSF IGERT program for supporting these students, the NSF Office of Polar Programs for allowing us to come to Summit, the Air National Guard for getting us to Greenland, and to all of the wonderful folks at CH2Mhill Polar Services for providing superior field support, including the extremely capable camp staff at Summit Station. A very hearty Thank You to you all!